I don't have terribly much to say today, but I wanted to share a few more post-blizzard pictures. Things are clearing up a little around here - still a bit crazy, but liveable. I'll be taking the bus to the grocery store today instead of walking because many sidewalks are still exceptionally dangerous (if they're not shoveled, they're icy ... and some are both), but besides that, everything has been basically back to normal, which is nice. A day and a half off was more than enough! 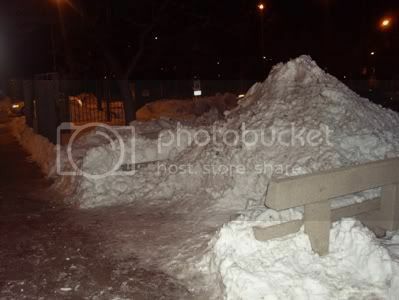 This is in my side yard - there's a picnic table somewhere under that mountain of snow! 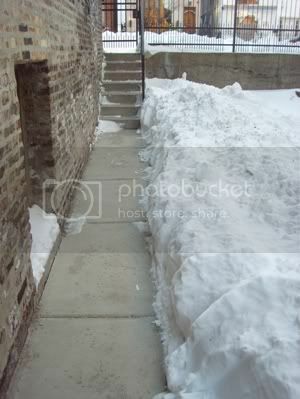 What an awesome landlord I have - the path to the street was totally shoveled and de-iced. No broken necks for me! 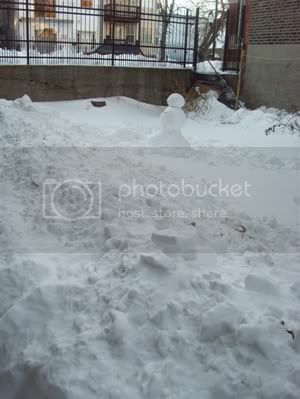 One of my neighbors built a snowman - adorable. 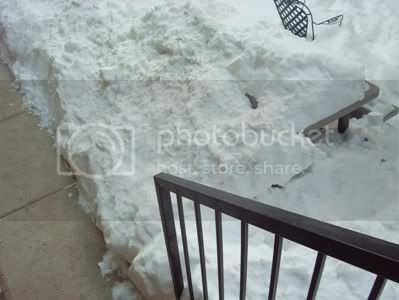 I might try and do an igloo today if I can convince at least one of my friends to come over. Most of them are students still, so it's unlikely ... I'm the only one with any real free time. Walking down the street I live on to get to the bus stop - there are huge piles of snow, but at least it's mostly shoveled ... there are paths to get to the main road. A lot of streets are still totally covered. 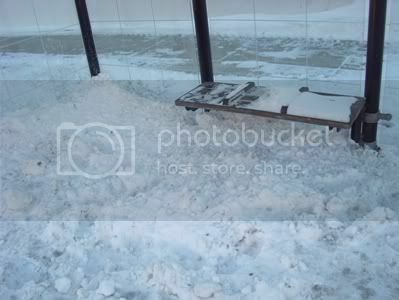 This is supposedly a bus stop. My feet are where the edge of the actual curb is. We have to stand in the street to get on or off the bus. It isn't as bad as it may sound, though - it's a lot better than taking the El, which has been not only problematic with the weather, but consistently overcrowded. Some co-workers said they waited almost half an hour for a train! 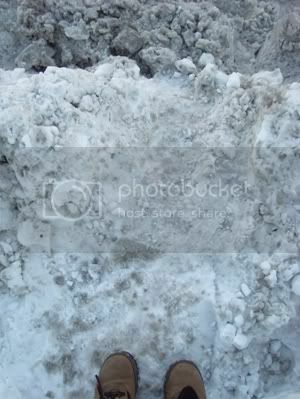 A pile of snow by the bus stop outside my office building. And that's all for today, folks. Enjoy your Saturday - be good to yourselves. I can only say...I WISH for once to experience snow like that! I'm in Florida for the weekend which has been rainy and cold but back in New Orleans, schools and businesses were closed Friday because of sleet and icey roads! We never get it so when we do, people don't know how to act. The Rascal Flatts concert was cancelled on Friday because the band couldn't get from Texas to New Orleans because of weather. This winter has been nuts, but I still wish for one experience with the kind of snow you are getting! I'd build a massive snowfamily. Wow. It's just so hard to imagine down here. It was 80 degrees yesterday! Today it's rainy and yucky, but still close to 70. We can easily forget that it's winter at all. Hang in there! New to your blog-your progress is awesome. Sorry back to topic-we have public transport trains here in Dallas-a fairly new concept compared to Chicago's El-and when we had our 'blizzard' last week, it was followed by rolling blackouts. Yeah I think you can see where this is going-people stuck on trains in the middle of nowhere for 4 HOURS. We have a long way to go until our public transport is actually a convenience, I fear. 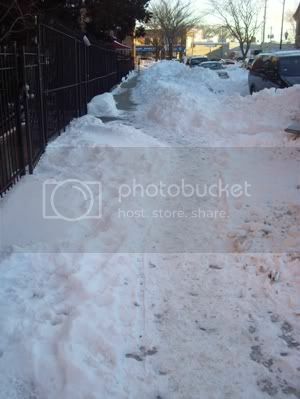 I am so jealous of your shoveled walk-what a great landlord!